Even five years after it was passed into law, the Affordable Care Act (ACA) continues to be one of the top concerns for employers - and for good reason. The ACA is one of the most comprehensive laws impacting employee benefits in decades. In this article, we provide a few tips that should help you prepare for the new reporting requirements. One of the most important things you can do is learn the ACA compliance basics. Getting a feel for employee thresholds, required forms, and reporting deadlines can help you avoid costly mistakes and fines. In a nutshell, the ACA requires that all businesses with 50 or more full-time equivalent employees (FTE) provide health insurance to at least 95% of their FTEs (and dependents up to age 26), or pay a fee. This article posted on the Society for Human Resource Management (SHRM) provides a nice overview of the reporting requirements and tips for what’s ahead. Am I Subject to ACA Requirements? With all the confusion surrounding the new law, you may be struggling to fully understand how the ACA affects you, your employees, and your business. That’s where My Workforce Analyzer might help. This add-on component for Sage HRMS tracks and analyzes the HR data that’s already in your system to help you make informed decisions regarding employee healthcare and ACA requirements. This unique tool works by monitoring your employee hours and coverage to help you determine if you qualify as a large employer, and what your obligations are under the ACA. In some cases, employers who are required to provide employee health coverage under ACA requirements might instead opt to pay the fine for noncompliance if it’s more cost effective to do so. 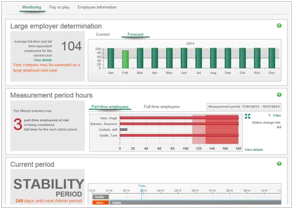 The interactive dashboards and analytics of My Workforce Analyzer help you evaluate this “Pay or Play” option and make an informed decision. Previously a separately-priced component for Sage HRMS, My Workforce Analyzer is now included free for customers on a Sage Business Care Gold or Platinum plan. Simply contact us for a new install code and serial number to enter into Sage HRMS.